Some of the best hotels in Northern Ireland can be found in Belfast and most are strategically located just steps away from Belfast’s hot entertainment spots. Talk about convenience! You and your stags will be offered excellent and comfortable accommodation in one of the best Belfast hotels within easy walking distance to Belfast nightlife. This way, you have access to a wide range of entertainment spots and can retreat back to the hotel at any time. Zorbing is one of the most thrilling sports on the planet and will add a touch of adventure to your already fun-filled stag party. 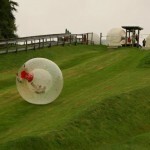 You can choose to go hydro zorbing where a water filled ball can float down the hill carrying you and two of your mates unharnessed; or you can go for harnessed zorbing where you are strapped onto the ball as it goes down the hill, all the while gaining momentum. Your mates will remember your stag party for a long time to come. After a crazy night of painting Belfast city red, you and the boys will surely need a hungry man’s breakfast; and what better way to silence those ravenous hunger pangs than by a real gourmet breakfast? Your hotel will provide you with breakfast that is fit for a king, from unique dishes to the local favorites, so you and the stags can indulge like you have never indulged before. Just take care not to develop a preference for this kind of breakfast unless your soon-to-be wife is a gourmet cook! With VIP entry to a classy nightclub, you and the boys will never want to leave. You can enjoy some good music, sample all manner of drinks and dance the night away. It is highly unlikely that another opportunity like this will come around in a long time so make the most out of it. Let loose and immerse yourself in some real Belfast entertainment. You will be accorded VIP treatment by a highly qualified and friendly staff.